EmulationStation is the official graphical frontend of the RetroPie project. ES was originally developed by Aloshi (code) and Nils Bonenberger (UI) but, since they have moved on to other projects, the RetroPie project keeps its own fork. That fork has made some improvements like video support, faster load times, favorites, and controller integration among others. Any reference for versions in this doc is related to the RetroPie's fork. Since ES version 2.4.0 you can create a list of your favorite games. You can also have a list of all games, and your last played games. These lists are all optional and in the example below we'll see how to enable them. Note: In order to use this feature, the theme you're using MUST support it. 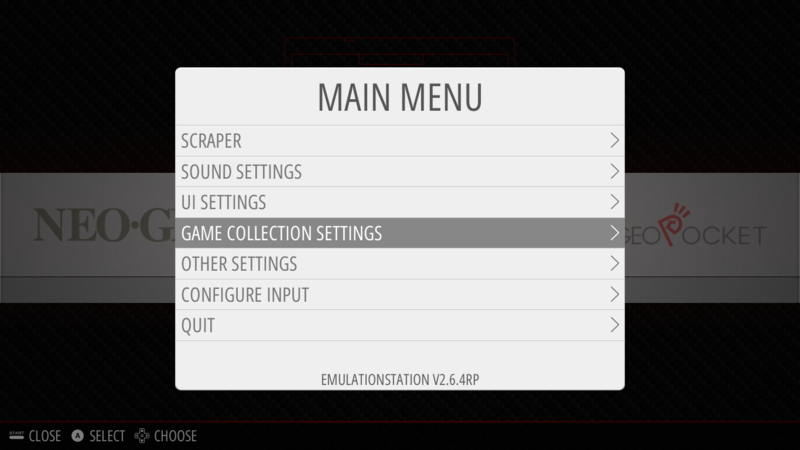 press Start to access the ES main menu and then select "GAME COLLECTIONS SETTINGS". 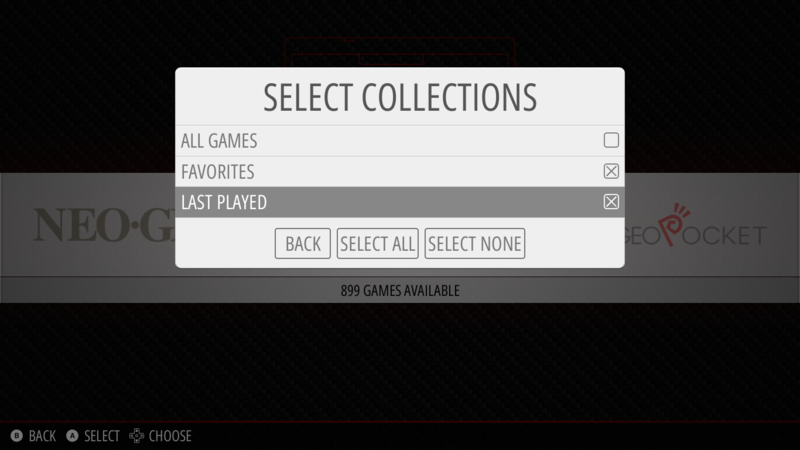 Next, select the first option: "AUTOMATIC GAME COLLECTIONS". And then mark those you want to enable. It's pretty simple: just move to the game you want to add and press the button you set to be Y. Pressing Y when the cursor is on a game already present in the Favorites, removes it from the list. 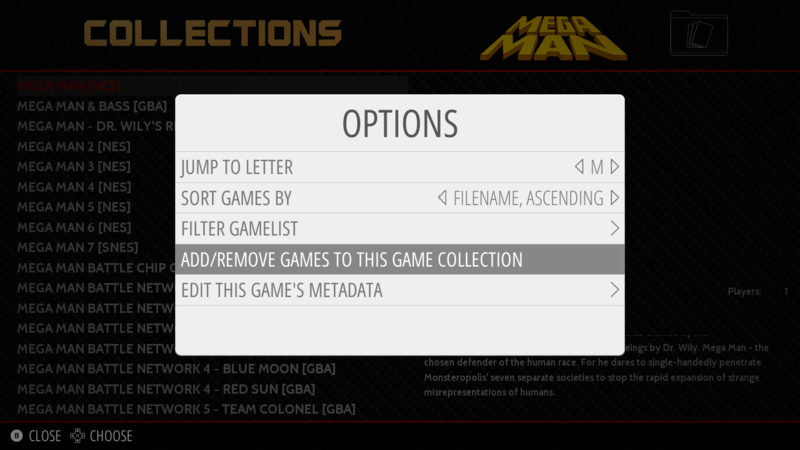 Since ES version 2.6.0 you can create a custom list of games. You can group games by any category you want. Examples: shoot'em ups, beat'em ups, Street Fighter, RPGs, Batman, TMNT, Mega Man or any other category you can think. If the name of the collection you're creating matches an unused theme folder, it will be shown in the main carousel as a new system entry. If there's no matching theme folder for the name you selected, it will be grouped under a new "Collections" carousel system entry. 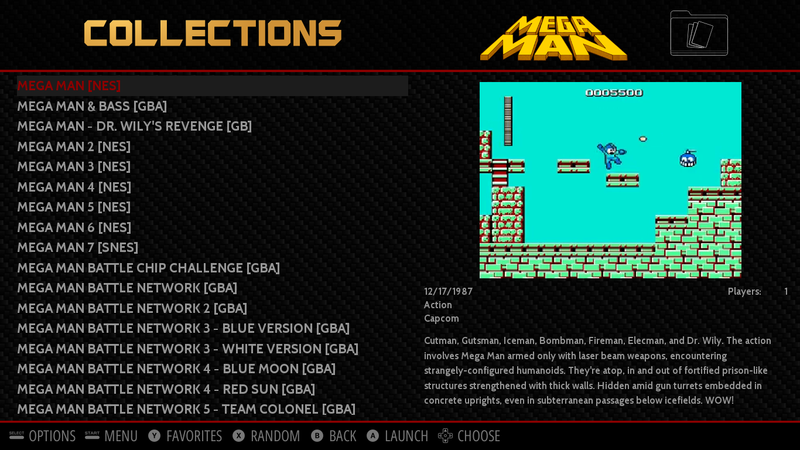 In the example below we'll create a custom collection to group Mega Man games. Note: You can either choose to create a collection based on an unused theme folder, or if creating from scratch you'll need a keyboard to type the name of your custom collection. 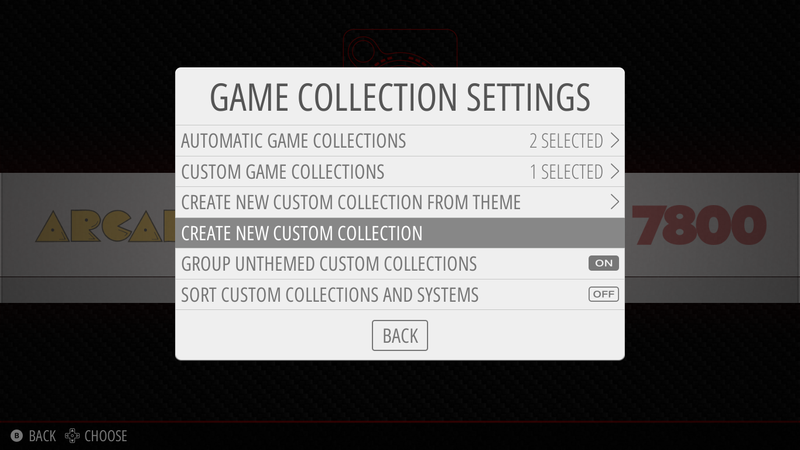 Select the option "CREATE NEW CUSTOM COLLECTION". An input box will be shown. 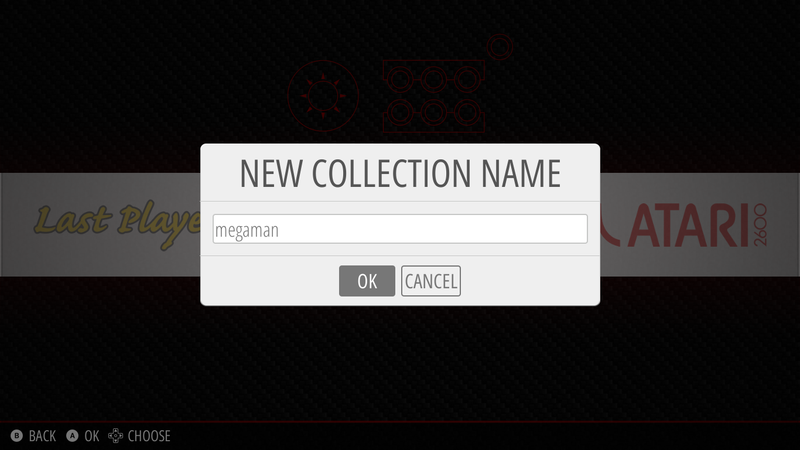 Type the name of your custom collection. After typing the name and pressing OK, you're now in a mode where the button you set to be Y adds a game to the collection. Look the message on top of the image below. 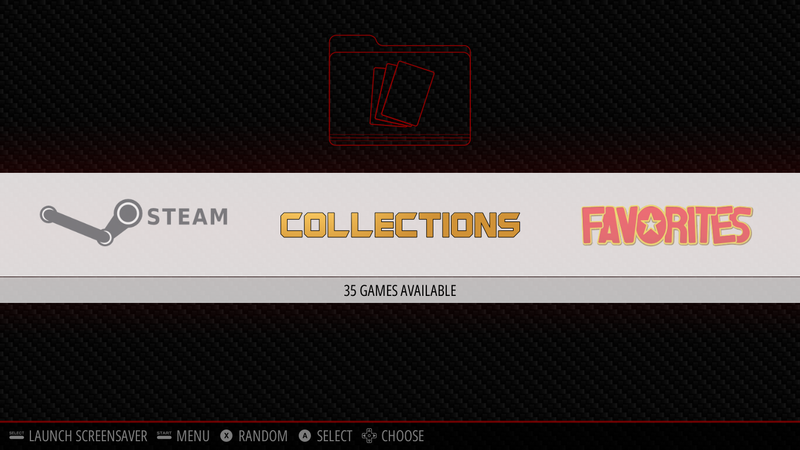 (Note: while in this mode you can't add games to your favorites). Move the cursor to the game you want to add to your collection and press Y, just like you do to add/remove a game to Favorites. 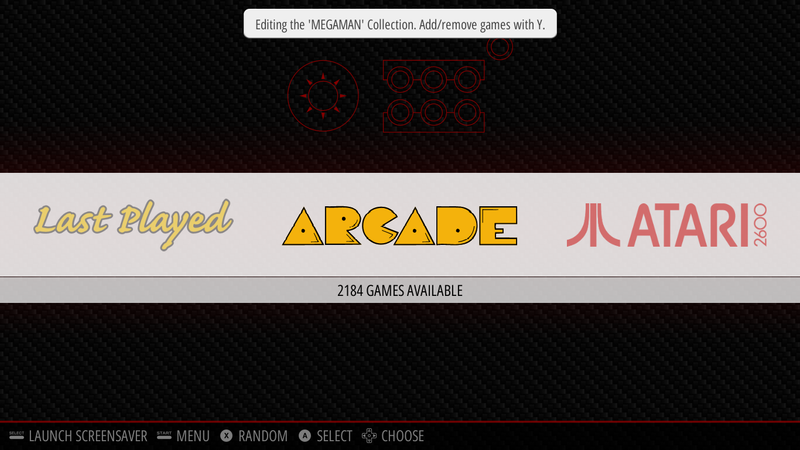 After adding a game you'll see a message on the top of screen, like in the image below. 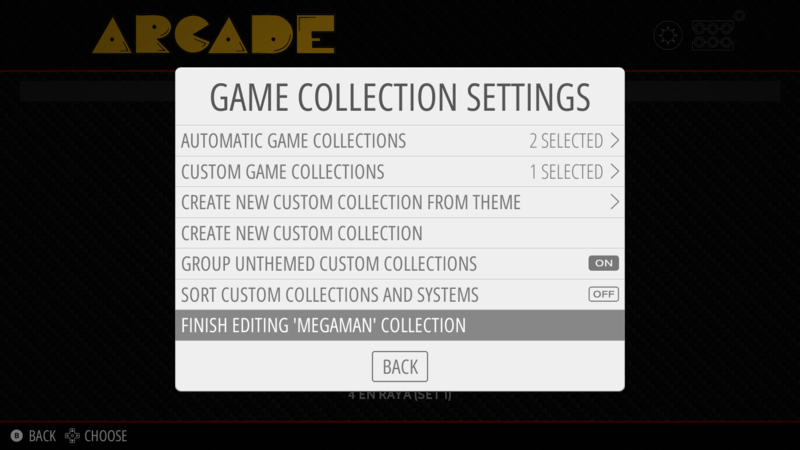 After adding the games you want in your collection, you can finish editing the collection by either: a) going to any game list, pressing Select and selecting "FINISH EDITING 'YOUR CUSTOM' COLLECTION", or b) going to "GAME COLLECTIONS SETTINGS" menu and then select "FINISH EDITING 'YOUR CUSTOM' COLLECTION". 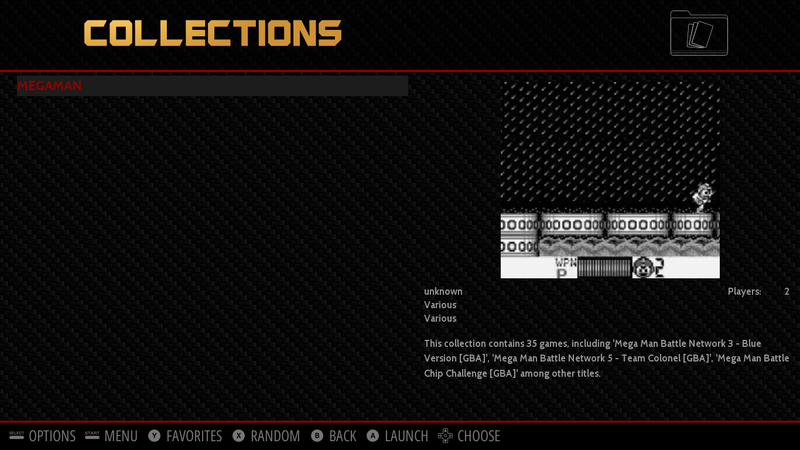 Now go to the "collections system" and you'll see your custom collection. Once you "FINISH EDITING 'YOUR CUSTOM' COLLECTION", the Y button recover the behavior of adding/removing games to the favorites list. 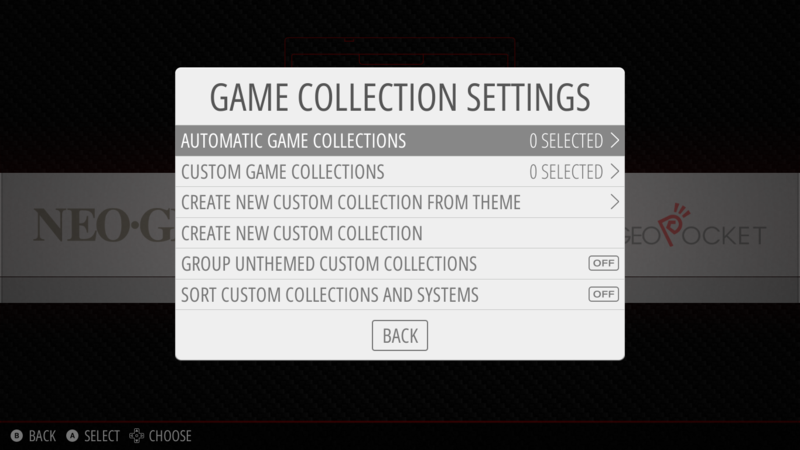 If you want to put ES on "editing custom collection mode" again, go the custom collection game list, press Select and then choose "ADD/REMOVE GAMES TO THIS GAME COLLECTION". ES uses xml files for its database and caches them on loading and exit, so any edits to the configuration files will need to be changed when ES is closed. 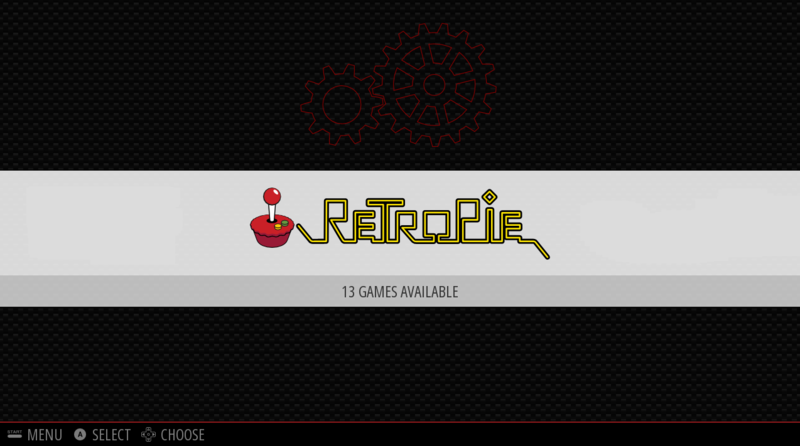 Because of the way the RetroPie-Setup script works custom configurations will need to be copied and edited in specific places, otherwise your custom edits would be overwritten anytime a system was updated from the RetroPie setup script. Note that any configs in ~/.emulationstation/ are symlinked to /opt/retropie/configs/all/emulationstation/ which means both paths will work. Note that anytime you add a new system from the RetroPie-Setup Script you will need to manually copy over the new system to the new location in order to keep parity. 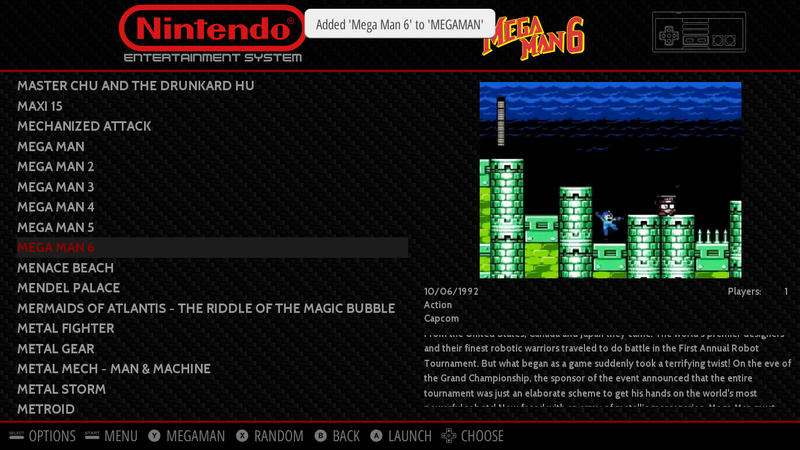 Retropie uses a file called platforms.cfg to generate the system configurations for es_systems.cfg you can create a custom platforms.cfg to override the default system for regional variants such as the Sega Genesis instead of Megadrive, Turbografx instead of PC-Engine, and the Magnavox Odyssey instead of the Videopac. Note that with any custom platforms.cfg you create you'll need to update all systems from the setup script to generate a new es_systems.cfg with your changes. There are several scrapers available in RetroPie: the built in EmulationStation scraper, Steven Selph's scraper and Lars Muldjord's Skyscraper. More information HERE. 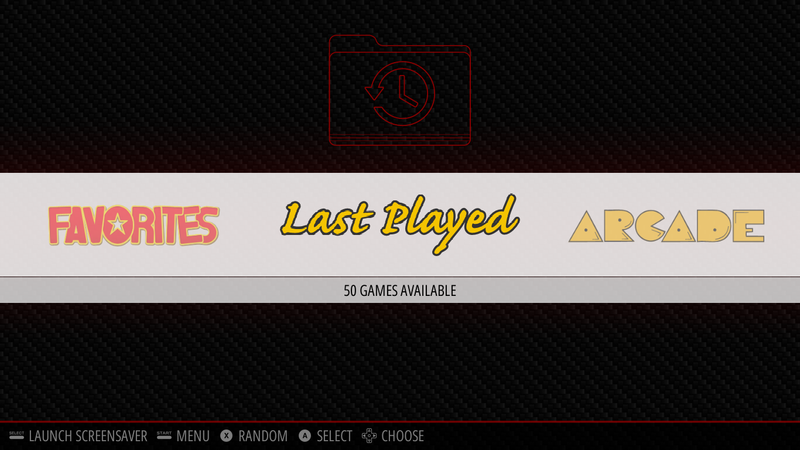 The gamelist.xml file for a system defines metadata for a system's games, such as a name, image (like a screenshot or box art), description, release date, and rating. EmulationStation has a few command line arguments that could be helpful to you for various customisation. Let's say you wanted to setup a kiosk but did not want to give access to the builtin scraper function or you didn't want the end user to be able to exit EmulationStation, you can simply edit /opt/retropie/configs/all/autostart.sh and append the corresponding command line argument. Because of the development hiatus, there has been some attention towards other front-ends. The following alternate frontends can be installed from experimental packages of the RetroPie Setup-Script but support is currently only preliminary.